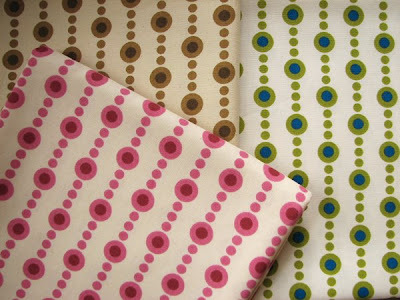 I just got samples of my expanded Amusement Park fabric collection for Braemore. I love it! It's printed on 54" wide 100% cotton canvas in three colorways, with two reprinted designs and two new ones. All the prints are for sale at Fabric.com, and arriving at other home decor fabric retailers around the country (and internationally!) soon. The Earth colorway is printed on unbleached duck so little cotton flecks show in the background. I don't think I've gotten that excited about beige ever before, but it looks so nice that suddenly I want to make 700 pillows for my living room. Along with a few other projects, so stay tuned. I love your fabrics! I'm trying to think of a really cool project I could use them for. I love the fireworks print! I'm going to have to make some pillows for my goddaughter...OR CURTAINS! I love how clean and straight foward your designs are. I could design a whole room around one of these collections! Love the colors and designs. Just fabulous! It's just so much fun! I particularly love the stacks print in reds. You must be giddy seeing them all together like this- bet it is very inspiring. Yeah! One at a time they'd be okay, but seeing a whole stack of folded yardage is pretty great, as you know! Congrats to you! I dig them all. Have fun with new projects. I'm sure your mom will be creating new things too. Jess - these are amazing! I'm going to HAVE to get the beads. No doubt. Well done! I love it!! I can just see lots and lots of summer shopping bags- and maybe a couple of lillte dresses. Oh, I really love the beads print. I check JCaroline almost daily and I love your amusement park line! This all looks lovely--especially the unbleached cotton calliope. What a thrill to see your work in such a tangible medium! Jessica, these are so beautiful! I might have to use one of the green and blue ones to re-cover the seats of my kitchen chairs. Are these upholstery grade? I know I am my mother's child when i get excited over fabrics like this. Your prints are lovely....the graphic designer things they are total eye candy! i really <3 the fireworks; yaye! Beautiful! I can't pick a fav. Unfiltered Meghan, yes they are. Jess, the Beads in Green/Blue is making me drool! Must have some. And on styling photos! So gorgeous! That fabric is from the last print run, so we'll see if they make some from the new colorways. I hope so, since I'll totally enjoy seeing those pictures. It looks really nice! I love the look of the unbleached cotton. It looks more soft and natural! :) Beautiful prints! great colors! And patterns. I may use some for my daughter's nursery. BTW, I just saw this gown while following a link from another blog (Something Old, Something New) and I thought of you. You wouldn't need a dress for a formal event, would you? 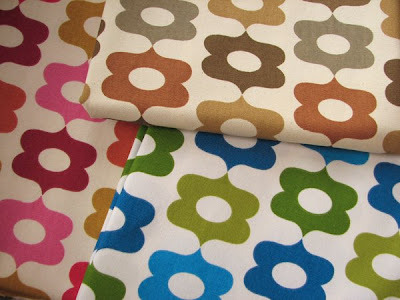 These gorgeous patterns would be great excuse to redecorate! Also would make a fabulous linen for my next party theme...hmmmm. Love them! Lovely prints!! all prints are so cute and kool. I love the bead pattern, I think I might laminate it and use it on my counter stools where my kiddies eat. I LOVE this fabric! but shipping to Canada was more than the cost of the fabric for the project I had in mind... do you know if it is available in Canada?!? Your fabric is gorgeous. I've made an apron from some of the first collection (http://pearlthesquirrel.blogspot.com/2009/03/sewing-without-making-messat-least-in.html)...can't wait to make something from the second. Congratulations! Nic, I don't know. Probably not yet, since Braemore is just now starting to ship to retailers, I'm guessing. And I don't know how to find out which ones carry it. You could try emailing JCaroline with a list of exactly how much you want to order, since their website gives shipping "estimates," and the actual shipping cost is often less than the estimate, I think. They could calculate the "real" shipping for you and you could see if it's still too much. They do this for many customers, i think. Just an idea! Hi Jess - just discovered your work and love it (also love orange!) 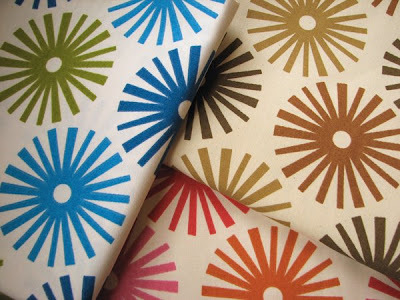 I like the orange/red calliope print you do, but love the background texture shown in the close-up piecture of the tan/brown range - is this the same background for all? So many of the pictures on the net of the orange/red make it look so bright (like against a white rather than beige background). The red-orange prints aren't on natural canvas with the little cotton flecks, but the background isn't white, either. I guess I'd call the ink color "ivory", slightly paler than the background in the brown colorway. 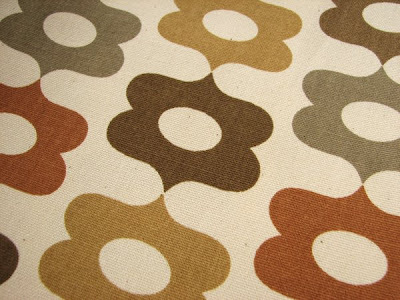 Any plans in the future to do the other colours on unbleached cotton like the brown colourway? Also, where can I source your fabric in Australia? Thanks for your time. No plans that I know of (it's not up to me, it's up to Braemore, the company who prints and distributes it.) 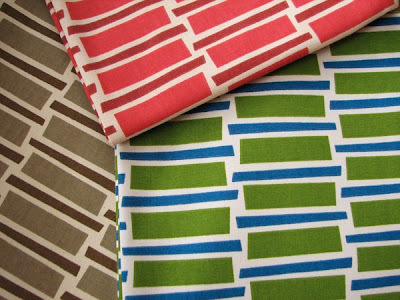 I don't know which retailers in Australia carry it, but if you're looking to buy wholesale, contact Caroline Devoy (cdevoy @ jcaroline .com) and she'll put you in touch with a rep.
Aussies can find Jessica's fabric at funkyfabrix.com.au!